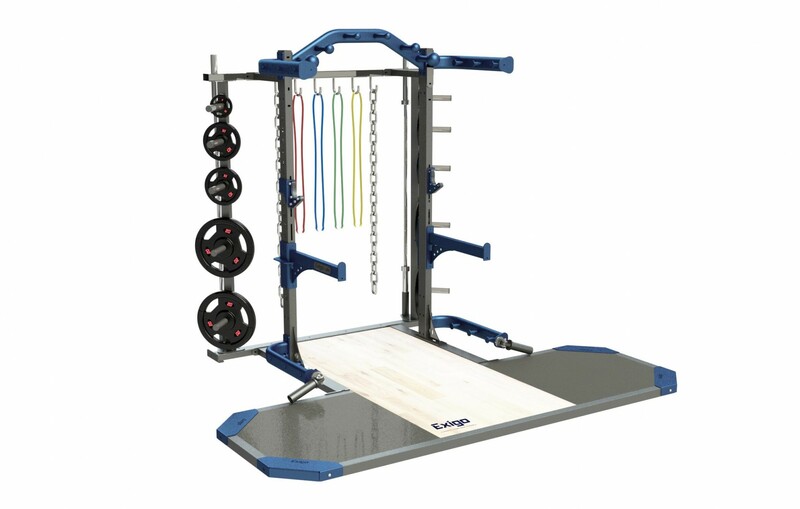 The Exigo Elite Half Rack is the perfect station for Olympic weight lifting for environments with space considerations. This professional Olympic Rack is manufactured with 3.5mm heavy grade 100mm x 60mm steel uprights. Base units are supplied with J Hooks, integrated Safety Spot Arms, Weight Horns, Band Pegs and a Multi Grip Chin Up Bar as standard for effective strength and power workouts. While having the ability to configure and customise this impressive unit to suit specific needs, this configuration is appropriate for elite level athletes and commercial gyms. Designed and manufactured in our UK factory the Elite Half Rack is constructed with heavy grade steel to battle the conditions of a busy commercial gym environment. Optional integrated lifting platform available - with or without bespoke branding. Available in 8ft and 9ft heights. Here at Exigo-UK we pride ourselves on being able to offer a comprehensive variety of customisation options; choose from one of our standard primary & secondary colours, or get an exact match you require as there are many other colour options available on request. Our secondary colours offer a textured finish which we recommend for increased grip on bars and grip points. All our equipment is designed & manufactured in our UK factory giving us complete control over products, this allowing us to engineer custom frame sizes and requirements to fit your individual needs. Our team of designers can produce a full 2D/3D concept gym design to bring all your ideas to life and help you realise your facilities full potential. The perfect station for Olympic weight lifting for environments with space considerations Manufactured with 3.5mm heavy grade 100mm x 60mm steel uprights Base units are supplied with J Hooks, integrated Safety Spot Arms, Weight Horns, Band Pegs and a Multi Grip Chin Up Bar as standard Configure this impressive unit to suit specific needs Appropriate for elite level athletes and commercial gyms Constructed to battle the conditions of a busy commercial gym environment Optional integrated lifting platform available – with or without bespoke branding Available in 8ft and 9ft heights Designed and manufactured in our UK factory.